A low-fat, grain-free alternative treat or training aid. Options: 14 oz. 2 lb. 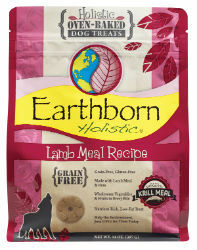 Perfect as a grain and gluten-free treat to help your dog maintain a healthy, active lifestyle. Each low-fat biscuit is packed with lean lamb meal protein and wholesome vegetables and fruits. Powered by the cutting-edge ingredient, MSC-Certified Antarctic krill meal, these treats are a nutrient-rich source of Omega-3 fatty acids. This special formula offers optimal health benefits and high palatability. Helps reduce tartar build-up and bad breath.